Removals Company Lyme Regis, Woods Removals Ltd. 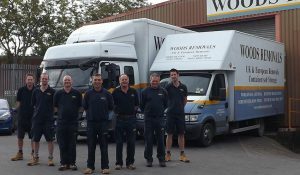 When it comes to moving in Lyme Regis, Woods Removals has 140 years of know-how. We’ve been going for well over a century and in that time, there’s no moving problem we haven’t solved. We’ll move you without placing undue stress on your shoulders and we’re sensitive to the fact that, for you, it can be a pressuring and tiring time. We’re the removals company in Lyme Regis with decades of experience under our belts and our movers, drivers and packers are all BAR-certified; this means that you get certain protections and standards which we’re delighted to uphold and even exceed. We know Lyme Regis extremely well – its thoroughfares and side-streets are where we honed and perfected our craft – and we know what we’re doing. When we help you move, we listen to exactly what it is that makes your move different and then we tailor-make our approach to suit you. We want the experience to be one of new beginnings and optimism rather than fatigue and defeat, and we’ll do our very best to ensure this result. We have a full packing/unpacking service that really takes the pressure off. What’s more, we don’t entrust this process to anyone; we have trained packers who come with the right protective materials and know how to dismantle and reassemble furniture. They know how to deal with grand pianos, valuable works of art and irreplaceable antiques. They’ll give to your belongings the same kind of care they’d give to their own and they’ll ensure that everything stays safe on the road. Removal companies in Lyme Regis don’t all take the same kind of trouble. We’ll get things moving by sending out an estimator to pay you a call and discuss all the details and unique requirements of your move. Then a clear and easy-to-follow quotation can be submitted for your approval. We can also help out with other services; if you need storage in Lyme Regis as a consequence of your move, we’ve got safe and secure facilities. Once moving day arrives, sit back and we’ll take care of everything in a timely and efficient manner so that you can be settled in your new home as soon as possible.